A couple of weeks ago I had a hankerin’ for some of my mom’s sloppy joe sandwiches garnished with coleslaw, but here in Spain canned Manwich—the sloppy joe sauce you simply pour onto a frying pan of cooked ground beef—is nowhere to be found. What was this poor boy to do? Well, do just like when I made pumpkin pie—make it from scratch. I did some Googling and came across the ingredients in a can of Manwich. Scarred for life! That stuff is mainly water, sugar corn syrup, and creepy chemicals. Perhaps not having the convenience of canned Manwich can be a good thing. More Googling…then I came across (coincidentally enough) a Spain-themed cooking blog. The author, Diana, is half-Spanish and is all about natural, healthy cooking and has provided a recipe for “real” sloppy joes here. Her ingredients list inspired me to put together a little how-to post for how to make sloppy joes while living abroad. Feel free to tweak it as you cook; mustard and tomato paste would probably round out the flavor nicely. Note: Since my dad’s side of the family is originally from West Virginia, a custom we have is to put coleslaw on top of the sloppy joe meat before topping it with a bun, but if that sounds weird to you (or you’re feeling lazy) don’t worry about the coleslaw. It’s below if you want it, though! Dice the onion, garlic, and pepper. In a large frying pan, cook them with some olive oil on medium high heat until onions are translucent and peppers are no longer bright green. Season with salt and pepper. In the same pan, brown the ground beef on high heat and add the chili powder and cumin. Turn the burner down to medium high heat, add the tomatoes, and continue cooking to reduce the liquid. Drizzle honey and apple cider vinegar. 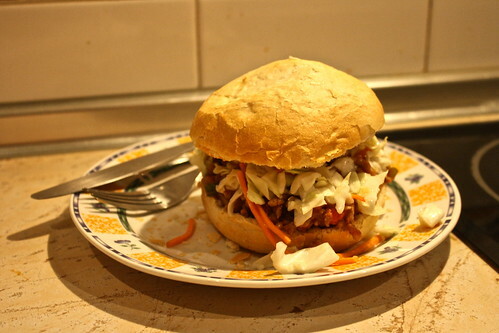 Serve on a bun with coleslaw. Finely chop the cabbage and julienne the carrot or, if you have a food processor, blend until chopped. In a bowl, mix the coleslaw ingredients together and put in the fridge to cool and marinate for half an hour. If you’ve ever lived abroad, how have you made your favorite meals without special ingredients from home? Talk about it in the comments section!